I awoke this morning to the sound of rain on the roof, a sound that has been mostly absent for the past seventeen months. Later, I checked the rain gauge and found that we had received .8 inch of the wonderful wet stuff. This, in addition to the .8 inch that we received last week, promises a respite for our long-suffering plants, as well as a respite for my bank account from paying high water bills every month. In short, the garden is looking much happier these days. The temperatures have moderated. We're receiving the occasional rain. The tough plants that have made it through the long seventeen-month-long drought are being rewarded for their toughness, and the gardener is finding another reason to be thankful during this Thanksgiving season. Thanksgiving has long been my favorite holiday of the year. In fact, I am thankful for Thanksgiving! But while looking through my Google Reader today, I found a post at Garden Rant about some of the things that gardeners are thankful for and found that I could second most of them. Even in this difficult year of gardening in Texas, there is much for which to be thankful. Above all, I am thankful for Nature. I garden with it and I appreciate it every day of the year - all the critters with which I share my garden, the insects (mostly helpful and some quite beautiful), the reptiles and amphibians, the small mammals (even though they sometimes dig holes, uproot things or otherwise make a mess in my garden), and, of course, the birds. I'm thankful for the wild landscape that is visible from my garden, especially the trees that have managed to survive. So many trees didn't make it and it saddens me whenever I look at their brown skeletons still standing there, but many are still living and breathing and I can only imagine what the early morning rain must mean to them. I am thankful for the horticultural experts who give so generously of their time to share their expertise with us non-expert gardeners and I'm thankful for all those plant researchers and breeders who keep working to provide us with new and improved plants every year. Gardeners today are very fortunate to live in a time when gardening know-how is so easily available through local nurseries, gardening publications including a whole stream of wonderful gardening books, and, yes, garden blogs! I am especially thankful to the talented writers and gardeners whose blogs I follow. I learn so much from them and I gain inspiration from their gardens. I am thankful for the trend in gardening toward the use of native plants and especially plants that are drought-friendly, toward the reduction of the boring expanses of mowed grass in the yard, toward the conservation and wise use of water, and especially toward the popularity of habitat gardens, creating gardens that are friendly to the critters with which we share an environment. I am thankful for fellow gardeners who so generously share seeds, plants, and cuttings. I am thankful for tough plants that make me look good - like I know what I'm doing as a gardener. I'm thankful to live in a place that, despite its shortcomings in some aspects of my life, allows me to garden twelve months of the year. And I'm thankful for my wonderful readers who keep coming back, and especially those who occasionally provide feedback. All things considered, I find myself happy and hopeful, and, yes, very thankful as I prepare for this Thanksgiving with my family. In spite of setbacks, there is much about which to be optimistic. I hope that your Thanksgiving finds you in a similarly upbeat mood. Here are a few more pictures from the fall garden that didn't make it into my Bloom Day post. Well, this didn't make it because it wasn't quite a bloom yet. I've been waiting for days for these buds to open, but succulents take their own sweet time about showing their colors. My little collection of succulents has done really well this year. This one didn't make it because I thought you'd probably be bored to see another yellow cestrum picture. This plant has been in constant bloom now since April and I've showed it to you many times, often with butterflies sitting on the blossoms. It is still going strong and will be blooming until frost. The little cigar plant is not very showy but I like these tiny blooms. Butterflies do, too. This is another one I've shown you many times - the 'Lucifer' canna. It has bloomed repeatedly throughout summer. Will this be its last bloom? 'Mystic Spires' salvia is full of blooms these days. I did have the yellow bells in my Bloom Day post but here's a closer view of its luscious blossoms. Here's another close-up of the interesting flowers of the shrimp plant. I love these unusual blossoms. I've had many Pipevine Swallowtail butterflies in the garden this year. In fact, they may be the most numerous of any of the butterflies that have visited the garden, but I haven't noticed that any of them have taken advantage of this their favorite host plant. Finally, here's another view of the brugmansia, with enough trumpets for a whole band of angels. Just a few more weeks and most of these blooms will be only a memory, but while they last they are glorious and they remind us of the pleasures of fall gardening. Before December's Bloom Day rolls around, we may get our first frost here in Southeast Texas. It normally comes around the tenth of December, although for the last couple of years it has come a bit earlier than that. This November Bloom Day, then, could be our last opportunity for a while to celebrate the blooms in our garden, so let's get right to it! 'Peace' was a birthday gift this year which means it came to me in August at the height of the drought and heat. It has struggled, but now is putting on a few new blossoms. The pink Knockouts refused to give in to the harsh weather conditions. They bloomed all summer long. So did 'Radazz,' the red Knockouts. 'Graham Thomas' rested through the summer, but he's always at his best in autumn and this year is no exception. Out in the citrus area of the garden, the little kumquat tree, added this year, is full of fruits of all sizes, many of which are ripening. The same is true of the Meyer lemon tree. And of the Mandarin orange. Only a good frost will stop 'Big Momma' Turk's cap from blooming. The purple trailing lantana is at its best in autumn and that's when many little skipper butterflies, like this Fiery Skipper, arrive to enjoy it. Nearby, this old bush lantana is full of blooms, too. The shrimp plant's blossoms last a long, long time. I showed you these same blooms on last month's Bloom Day. Another bloomer that is in its glory in autumn is the Cape honeysuckle. What can I possibly say that I haven't said many times before about this wonderful plant, Esperanza or yellow bells? The tropical milkweed continues blooming profusely and continues to get a few Monarch butterflies dropping in to sip its nectar. I'm seeing one or two of the beautiful butterflies on most days but so far I haven't found any eggs or caterpillars on the milkweed, a disappointment to be sure. Purple porterweed - I have certainly enjoyed this plant with its strange little blossoms. All summer I wondered if the brugmansias would ever find the energy to bloom this year. Now it's November and I have my answer! I never had to wonder about these old cannas. They have bloomed all spring, summer, and fall. Bulbine was another plant that didn't do much for me during summer but now that fall is here, it is attempting to make it all up to me. Copper Canyon daisies have their glory days of bloom now. They'll bloom until first frost. Even some of the gerberas are getting in on the blooming action once again. The Hamelia patens' major customers, the hummingbirds, have mostly moved on now, but I often find their new clients, the sulphur butterflies, hanging from their blossoms. Even the 'Rouge Cardinal' clematis has found new life and continues to put out a few of these wonderful blooms. As we wind down this year in the garden, I continue to be amazed that so many of my plants have done well in a very difficult 2011. I'm just happy to have any blooms to show you this month, and I look forward to visiting gardens around the world to see what is blooming on this Bloom Day. 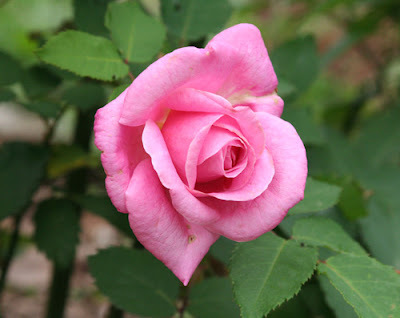 Check out Carol's May Dreams Gardens where you can find a list of all of them, and thank you for visiting my garden this month. The 'Dortmund' rose is a special favorite of mine. I love its simple single blossom, its dark green leaves, and the pretty orange hips that it develops in the fall. Plus, it's an old rose, unfussy in its requirements and tough enough to take most anything that Mother Nature throws at it. Even so, the 'Dortmunds' in my garden have struggled this year. They never really put on the big flush of blooms that they normally have in spring. They bloomed but the blooms were a bit sparse. And throughout the long summer, when normally they would have at least a few blossoms, no new blooms came. But finally, now that we are having slightly cooler weather and even an occasional rain, the roses are beginning to perk up a bit. The plants are full of orange hips from the earlier blooms, but I noticed today that the first bloom of autumn had appeared and it looks like more are on the way. The 'Dortmund's' rose hips are very colorful and decorative. They could be used in fall decorations or to make up a tasty batch of rose hip jelly. Or one could just leave them on the bushes, as I do, to be devoured by wildlife this winter. My 'Dortmunds' were not the only ones that suffered in this summer of drought. The Arbor Gate, my favorite local nursery, has 'Dortmunds' climbing its entry gate and I couldn't help noticing when I visited throughout the summer that those plants were not doing extremely well either. So, I take comfort that my roses' less than stellar year was probably not due to anything I did or didn't do. Instead, it was the awful weather, the heat and the drought. Even a tough old rose is likely to need to rest under those conditions. Let's hope that 2012 will be a better year for roses and for the gardeners who love them. Veterans Day is that one day of the year that we set aside to remember the service and sacrifice of those have served in our armed forces as well as those who are still serving. In fact, we should remember that every day of the year, because every day that we remain safe and free is a tribute to the dedication of those who guard our freedom. But on this very special day, we especially honor them and their families and we pledge that we will never forget the sacrifice that they have made for all of us. 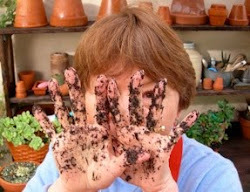 Heritage Gardening TV Pilot from Casey O'Quinn on Vimeo. I hope one day we'll be seeing this show on our own television screens. The autumn of one's life is a time for reflection and autumn in the life of a garden is a time for reflection, too. Whenever I look back over my life, I find that I tend to dwell more on mistakes that I've made and regrets that I have than on any paltry successes. It's the same with my life as a gardener. This year, in particular, there are plenty of failures to reflect upon and to dissect, but at least this year, unlike many years, a lot of those failures were beyond my control. The vegetable garden, just to give one example, was pretty much a bust this year. Some of the crops, like green beans and squash, still did well and the multiplying onions still multiplied, but most of the plants struggled and finally just couldn't cope with the heat and the drought, even though I was providing supplemental water. The corn dried up before it ever produced mature ears. The tomatoes bloomed but never gave me more than a few usable fruits. Even the heat-loving peppers struggled. It was not a good year for plants living in full-sun conditions in Southeast Texas. I've documented here before how many of my plants suffered through our interminable summer and how some of them did not make it through to fall, so I won't belabor that point again. I think we are all tired of hearing and reading about (and I know I'm tired of writing about) the drought. The point now is to review what lessons we've learned and think about how we can apply them in the future to make better gardeners of ourselves. One lesson learned is that my use of water is unsustainable. Our water bills were astronomical during the summer as I tried to keep my plants going until the rains came. We are not rich people. We must live on a budget and so I can't continue to spend so much on water. I need to find a way to conserve and use the free water that comes in the form of rain - when it comes - and to use it wisely and economically. I also need to find better ways of delivering the water that I must pay for so that it gets to the roots of plants that need it without evaporating or being wasted. Perhaps most importantly, as I add plants in the future, I must give prime consideration to their water needs and plant only those plants that are water-wise and drought tolerant. I think it is very likely that drought is the new norm for our area, so we have to learn to live with it and accommodate ourselves to it if we want to be successful gardeners. Thinking ahead to the changes that I want to make this winter, there's a dead apple tree to be removed and possibly a couple of trees in the front yard that could reduce water consumption there and leave more of the precious liquid for the other trees. I've been forced to concede that we probably do have too many trees in our front yard, although the concept of "too many trees" is something totally foreign to me. There's also a new bed that I want to put in around my little pond. My long-term goal still is to have a yard completely filled with planting beds with little or no lawn and every new bed that I can put in is a step in that direction. Unfortunately, I can't do it all in one fell swoop but have to do it as time, energy, and money will permit. And, as always, there are a few plants, although not as many as in past years, that are misplaced and need to be moved to more propitious locations. The fall/winter vegetable garden is thriving so far and I just need to finish planting it. I have three empty beds that could provide lots of good eating through our short winter and spring, but I need to get those seeds into the ground, probably this week. There are plenty of things to regret about this year in the garden, but I have to remind myself that there have been successes, too, and that, in fact, most of my plants have come through with flying colors. That is just the encouragement that I need as I plan my activities for this fall and winter in the garden. We got enough pictures at the Denver Botanic Gardens to do several more blog entries, but I feel the need to get back to writing about my own garden and what's happening here, so let me wrap up my visit there with this one last look. I was distressed that many of the plants whose names I wanted to know did not have name tags, but then there were some places where there were plenty of tags - as here in the alpine garden - but the plants were not visible because they were covered with snow. We visited on Saturday, four days after the snowfall, but in shaded areas of the garden, the snow still lingered. The snow still clinging to the evergreen trees and shrubs made a pretty, wintry scene. In some parts of the garden, shrubs and vines retained their leaves which were very colorful. At times the colorful shrubs were still surrounded by patches of snow. A wonderful feature of the garden was the sculptures by the Native American (Apache) artist Allan Houser which were integrated throughout. This one is called Spirit Dancer. What's better than one Spirit Dancer? How about two? This sculpture at the entrance to the ornamental grasses garden was by another artist, not Houser, and I failed to make note of the name. But I know that the name of the sculpture was My Children. I found it very affecting. I loved the colors and textures of the ornamental grasses. I've become a big fan because they are so resilient and drought tolerant and I'm trying to add more to my own garden. One that I do have in my garden is Mexican feather grass. Sad to say, mine does not look as healthy as these clumps. Grasses and snow - a nice combination. Grasses and sculpture - another nice combination. Allan Houser drew upon his Native American heritage in his art, but he was also influenced by other sculptors, namely the English sculptor Henry Moore. This Houser piece could easily be mistaken for Moore's work. The Moore influence showed in many of the pieces on display. Many of the plants also had a sculptural quality, like this wonderful staghorn sumac, which I absolutely loved. I would like to grow it in my garden but I'm not sure that it would do well here. I need to research what kinds of sumac I might be able to grow. They are terrific plants for wildlife. Another thing which I found very interesting in DBG was the use of water features. I particularly liked this fountain with the water bubbling out of and spilling over the rock. I wish I could have brought it home with me. The birds in my backyard would love it! Another one that I liked very much was this fountain. It might be a little big for my yard though. This sculpture at the entry of a walkway was a show-stopper. So was this one which shows the other strong influence in Houser's work, his Apache heritage. And there I am, your intrepid reporter, looking for plants but also hoping to see birds - thus the binoculars around the neck. 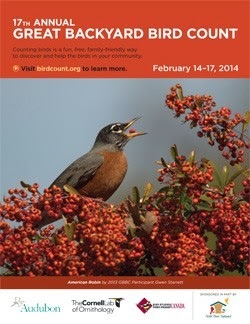 The birder's motto: Be prepared! You never know when something wonderful might fly by. Not too many wonderful birds were about on this day, but the chickadees were well-represented. This Black-capped Chickadee peeped at me through some colorful crabapple leaves and we'll let him have the honor of being the last image from Denver Botanic Gardens. When you are in the Denver area, by all means, make time for a visit to the gardens. We saw them not at their best, but I am certain that the place is worth a visit at any season of the year.